"Well, a friend had given me the music, and he said, 'You should look at this,' because he was crazy about Bartók," Hadelich told me over the phone from Portland last week. We were talking about his new recording of the Mendelssohn Concerto and Bartók Concerto No. 2, recorded with the Norwegian Radio Orchestra, conducted by Miguel Harth-Bedoya. "You know, there's no reason not to start looking at music like that when you're very young." "Of course, the first Bartók pieces I played were the Romanian Folk Dances, which are actually pretty straightforward in comparison," Hadelich said. "But I never performed (Bartók Second Concerto) until the Indianapolis Competition, years later." 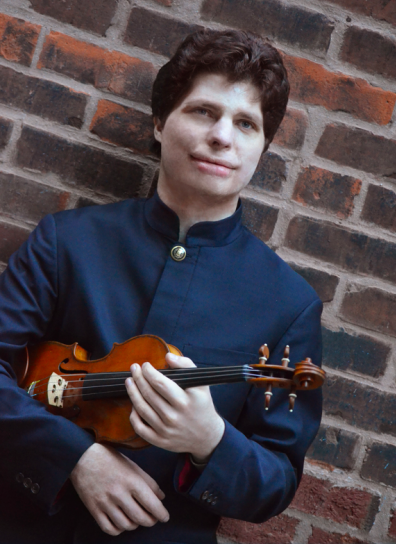 That was in 2006, when Hadelich took home the gold medal in the International Violin Competition of Indianapolis. Since then he's kept busy concertizing around the world and making recordings, including Flying Solo (2009); Echoes of Paris (2010); Histoire du Tango (2013); and Sibelius and Adès Concertos (2014). For Hadelich, the musical vocabulary of Bartók feels like a first language. "I played (Bartók Violin Concerto No. 2) as a child; I studied it. I really, really liked the piece. I learned both Bartok Concerti back then; then I learned the solo sonata much later because that's another level," Hadelich said. "But I really love Bartok's music and language. The first time you hear a piece in certain style, it takes you a bit of time to get used to that. Because I was introduced to it so early, somehow it makes a lot of sense to me; it feels very natural to me. " A more recent revelation for Hadelich has been to discover more about Bartók's lyrical side. "Performers often play this music a bit too aggressively. They exaggerate the expressionist quality. That quality is in there in the music, but I noticed, when I listened to the premiere recording of this piece, how lyrically it was played." The concerto was written for and dedicated to the Hungarian violinist Zoltán Székely who premiered it on March 23, 1939 -- a bleak time in human history, between the two World Wars. "Menuhin's recordings and performances are more famous, and those are the ones that I knew, growing up." Hadelich said. "They are very emotional; they have a lot of power. Actually, it might be Menuhin who started playing it in a more extreme way. When you emphasize the lyrical side, though, you also make it more accessible. People don't feel like they're overwhelmed by 40 minutes of this rough, tortured music. The Székely recording is amazing. It has its imperfections -- he has a peculiar way of playing, everything is really sharp, and the orchestra has moments when they're kind of falling apart because it's such a difficult part to conduct. But it is incredibly exciting. At the end, one can hear the huge success: the audience is incredibly enthusiastic. It's really kind of amazing go back in time and hear this." "(The Bartók) actually has so many beautiful moments, lyrical moments. Oftentimes people think, 'It's Bartók, everything is so tortured and rough.' Certainly, there are moments like that. In fact, there is a moment in the last movement where he writes 'ruvido' which is 'rough.' Those extremes are there, but the other extreme is there, also," Hadelich said. "Even at the beginning, with the harp and then the violin's first entrance, it's lyrical and warm and soulful. It's sort of an unfortunate tradition -- which I follow too because I don't want anyone to boo me off the stage -- of playing the very first opening on the 'G' string. It really does not fit the piece and the character there, but I tried to do it in a way where it doesn't sound to much like a 'G' string moment, but it's a different mood, it's very warm and harp in the background. You kind of pretend that it's Ravel or something. It's very French, all the orchestration, that was a huge influence on Bartók. It's a funny mixture between French orchestration, Hungarian rhythms and melodies and idioms, and German compositional influences, too." Hadelich had been itching to record this piece for a long time before he talked conductor Miguel Harth-Bedoya into recording it together. "Bartók is actually notoriously difficult to conduct -- a lot of conductors are afraid of the Bartók Second Concerto, more so than maybe any other early 20th century (violin) piece. I think it's harder to conduct than Berg, Stravinsky, Prokofiev, Shostakovich or any of those," Hadelich said. "There are so many tempo changes, so many things that happen in the orchestration. But Miguel just mastered it without any fear at all. I was very happy because we were able to go beyond what one normally manages when preparing for a concert. Often I find, with this piece, you're lucky to just get the ensemble together. There are so many details, you don't really get to the part where you're talking about the musical side of it. We tried quite a lot to follow the tempi and the instructions that Bartók leaves, and a lot of these tempo changes are supposed to be very fluid, almost not really noticeable. The way it's often done, every accelerando is so big, every ritardando is so big, and in reality, what he marks are tiny, tiny differences in tempi; for example, the difference between (a metronome marking of) 66 to a half note and 63 to a half note, and it's a ritardando for 20 bars to get from one to another. But when you do it pretty literally, I feel like the piece hangs together in a better way, especially the last movement. That's really a key to making it into a cohesive movement; otherwise it can sound too exotic." And what of the Mendelssohn Concerto? Augustin has performed it many times, and yet "it's still fun, I still love it," he said. The struggle with Mendelssohn, not just for Hadelich but for many violinists, is simply one of old habits and over-familiarity. "This is one of the earliest of the big concertos that people learn," Hadelich said, "but the problem is that you have old habits that get in the way. Also, the violin tradition gets in the way because you hear everybody play it." Those things that everyone else does can stick with you. For this reason, "there were moments in the past when I avoided the Mendelssohn Concerto," Hadelich said. "I played it every now and then, to see how it felt at the moment, but I was always trying to stay away from it." "Eventually I managed to get a fresher look at the piece," he said. "I tried to play it as though this was a piece I didn't know at all, and I just opened the music." How would he play it, if he'd never seen it before? He simply threw away the old way of playing it and invented a completely new approach. "Apart from this issue, I think that the Mendelssohn, in some ways, is the hardest of the Romantic concertos," Hadelich said. "It's very pristine and exposed, and it needs to be so clear. It's very classical, in terms of many of the gestures and articulations. You need this kind of clarity and precision. It's sort of fast-paced, and you don't settle into the movement and start enjoying it the way that you can in many other pieces. Things keep happening." It might not be as technically difficult as something like the Tchaikovsky Concerto, but "you can't get away with anything in Mendelssohn. You can get away with a lot in Tchaikovsky, in a way. There's a lot of leeway in terms of tempo, rubato, expression and articulation. You have a lot more room; but in the Mendelssohn, you don't. It's difficult in the way that Mozart is also difficult: the part is very exposed. It doesn't sound that difficult, so the expectation is that it is perfect, clean, beautiful, expressive, dramatic -- everything. It helps to perform it with a good orchestra that brings energy, expression and interesting things to it; that can really sweep you along in this piece. That definitely helped in this case. July 21, 2015 at 04:28 PM · It sounds like he's just taking it up an octave. Wow, good ear, Evan, that slid right by me! July 22, 2015 at 06:47 PM · I heard Hadelich play both Beethoven and Brahms concertos on different occasions. Very powerful and lyrical. I'll be curious to hear his Bartok. That Szekely performance has a special sort of magic about it, and I'm glad that not everyone thinks that Bartok needs to be played as spikily as possible.If you ever listen to Bartok playing his own works, he plays them very beautifully and lyrically.